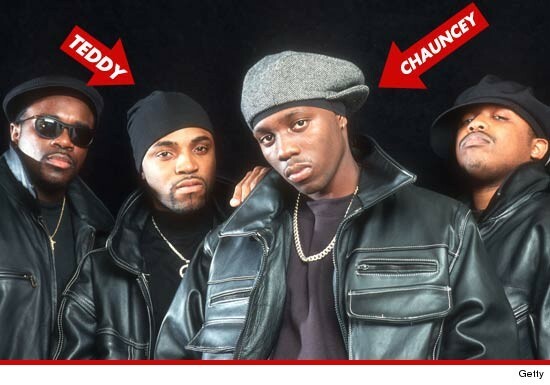 Chauncey Black, one of the founding members of the group Blackstreet, does not like the way Teddy Riley works it ... so he's taking him to court. Black claims in a new lawsuit he owns the name, but Teddy's been using it illegally. It's actually a bit more complicated. Black says originally Teddy owned the name but his trademark expired and Black then snapped it up. Black claims Riley has flagrantly violated his rights by performing with another band and passing themselves off as Blackstreet. As for why they're not performing together, Black claims he can't work with Riley because of his "uncooperation." A rep for Riley tells TMZ, "At this time we have no comment on ANY of the ridiculous and frivolous claims APPARENTLY being made by Chauncey Andre Hannibal aka'Black.'" Suing each other over the band name, changing members, a quartet etc. Too many similarities. First Guy and now Blackstreet?!? Damn, that Teddy Riley and his massive ego! Exactly. To be honest, I wasn't really interested in Blackstreet anymore after David Hollister left anyway. Does Teddy really need 2 use the name? He has Guy and his own name. Seems silly without knowing the details behind this squabble. As far as I'm concerned, BlackStreet is Chauncey and Teddy, but they have nothing if they can't work together. Teddy has his own name and Guy, and never seems to come back to BlackStreet. Maybe the court will be in favor of Chauncey. Chauncey to be a guy who doesn't care about anyone but himself. Yes Teddy has a big ego to. He dogged the Hall brothers out too.